I’ve never given much thought to crafting for President’s Day, but it does fall at a good time for some indoor fun. 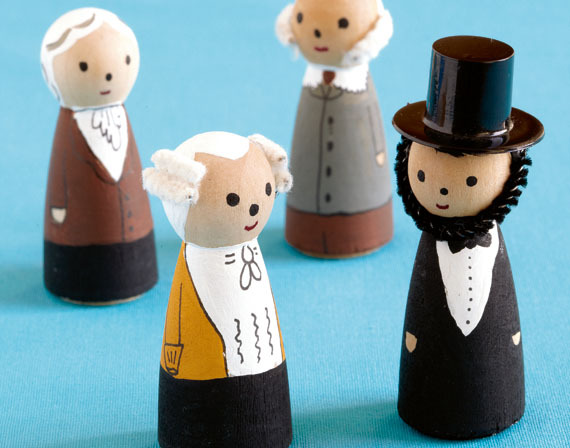 These are so adorable, and look like fun to make. I can imagine making all kinds of little people! Maybe a chess set! The idea comes from Heidi Kenney’s new book Every Day’s a Holiday: Year-Round Crafting With Kids, which I definitely plan to check out, and Etsy has a how-to for this project on their blog here. You can find plain pegs at Caseys Wood or on Etsy. Please let us know if you give this a try! These are very cute and as you say so adaptable to other kinds of people. Thanks for checking in with us! I haven’t tried making them yet, but I’m looking forward to giving them a try. They would make very cute for cake toppers, or little party favors!